If you’ve ever read or seen anything by Dr. Perricone you probably know that he is into healthy eating and healthy foods. He has a list of his top 10 super foods and sprouts happen to be number 9 on that list. Below is an article that was recently on Oprah’s website talking about the benefits of sprouts and also how you can use them on a daily basis to give yourself a healthy boost. Sprouts are a highly nutritious food. Grown locally year-round, sprouts are a good source of protein and vitamin C. A sprout is produced when a seed starts growing into a vegetable. 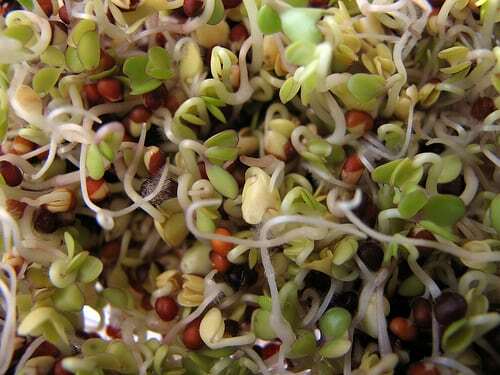 Sprouts can grow from the seeds of vegetables, grains, legumes, buckwheat and beans. Sprouts vary in texture and taste. 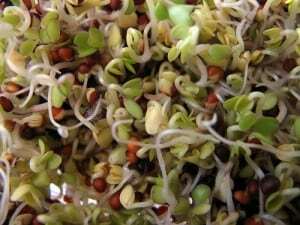 Some are spicy (radish and onion sprouts), some are hardy and often used in Asian cuisines (mung bean), while others are more delicate (alfalfa) and add texture and moistness to salads and sandwiches. There are a great many reasons to eat sprouts. As we age, our body’s ability to produce enzymes declines. Sprouts are a concentrated source of the living enzymes and “life force” that is lost when foods are cooked or not picked fresh from your own garden. Additionally, due to their high enzyme content, sprouts are also much easier to digest than the seed or bean from which they came. All nutrients necessary for life are contained in seeds—a food category that includes grain kernels, beans, legumes and nuts. Because sprouts are so fresh and do not sit for days or weeks in warehouses, we know that we are getting optimum nutrition. It’s easy to see the benefits of sprouts and why you should be adding them daily to your diet. The best way to do that is by growing your own sprouts at home so you can be assured you are getting the highest quality freshest produce anywhere. To learn more about sprouting be sure to read our other great articles and watch our informative video clips.